Who says 11 year olds don't know how to have fun? After the untimely death of his father, 11-year-old Obie runs away from his suburban home which he shares with his mother and sister. He accidentally finds himself in South Side Chicago where trouble soon finds him. He is subsequently mugged and the most unfortunate thing of all is that the watch his late father gave him is taken. He soon meets a young boy called Scam who is trying in vain to find his father, whom he has never met. Scam is about to be put into a foster care if he cannot prove a blood relative is caring him for. As the two boys become fast friend they decide to search for his father. Along the way two gangsters chase after them because the two boys have stolen their car. Did I mention it happens to have a dead body in the trunk?! This is a feel-good movie that can be enjoyed by all. As a child this movie was my favourite and I would watch it everyday. 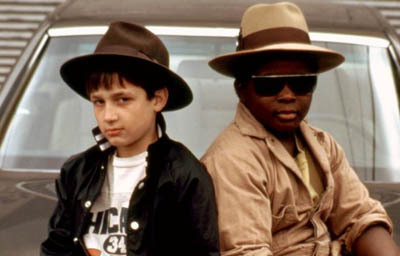 It thrilled me that two kids around my age could steal a car and go on a wild adventure. The two kids could not be any different. We have a black kid form the wrong side of the track teamed with a white kid from suburban life. The way the two come together is exciting and fast paced with laughs along the way. It combines humour and serious issues in a light-hearted way and keeps the 80's feel good vibe alive and kicking. If you have not seen this movie already, then why not? I recommend you view it and treasure it always. And if you have seen it, then watch it again! This movie embodies friendship. This is good in any movie. There is hardly any violence, so it can be viewed by most ages. It is quite a corny movie and in some places a bit unbelievable, but in my eyes is your typical fun 80's movie. The actors themselves are not household names but they play their characters very well. You will find yourself both captivated and saddended by the two boys predicaments but will cheer as it all comes together in the end. The bonding of Obie and Scam will warm your heart. And, as they get closer to what they are trying to achieve, you may find yourself crossing your fingers for them. The 80's stereotypes in this movie such as the character Johnny Red may make you squirm and roll your eyes!